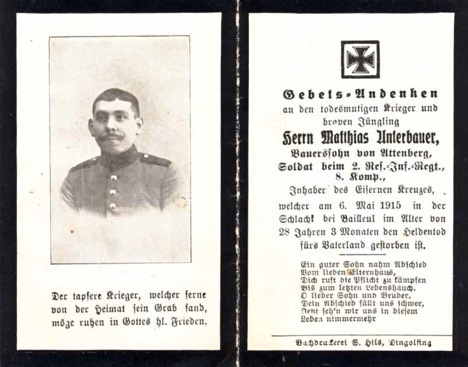 WW1 German Death Card (Sterbebild) for Army Soldat Matthias Unterbauer, 8 Company 2 Reserve Infantry Regiment. Farmer’s son from Attenberg. Was awarded the Iron Cross. Killed in the battle by Bailleul, 6 May 1915. He was 28. The back of the card has a rendering of an angel with a soldier. The double page, single sided card measures about 5.25 x 4 inches. Includes a slip from the German Graves Office listing him as buried in St. Laurent Blangy, France. 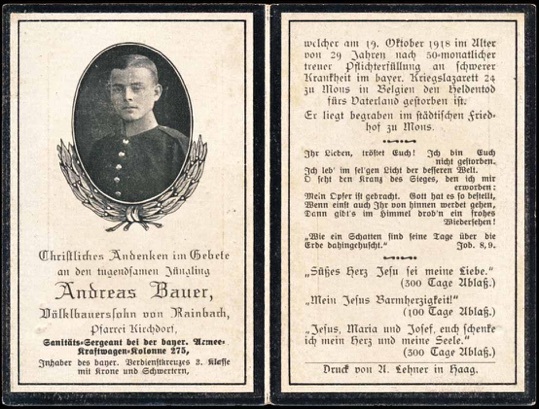 WW1 German Death Card (Sterbebild) for Army Sanitäts Sergeant Andreas Bauer, Bavarian Army Kraftwagen Kolonne 275. Was awarded the Bavarian Military Service Cross 3rd Class with Crown and Swords. After 50 months true service, he died of a difficult illness in a military hospital in Mons, Belgium. He was 29. The double page, single sided card measures about 4.5 x 5.75 inches. Back of card has a religious scene. Includes a slip from the German Graves Office that he was buried in Vladslo, Belgium. 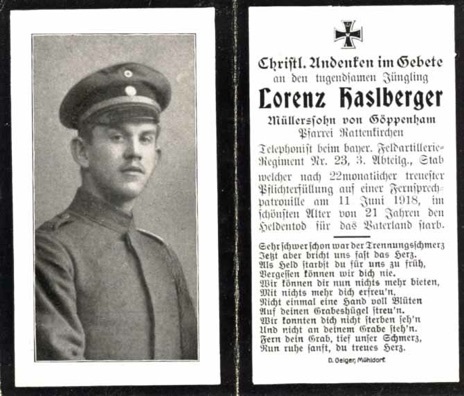 WW1 German Death Card (Sterbebild) for Army Telephonist Lorenz Haslberger, Staff 3 Abteilung 23 Bavarian Field Artillery Regiment. Mill owner’s son from Göppenham. After 22 months service, he was killed on a telephone (line?) patrol, 11 June 1918. He was 21. The back of the card has a rendering of an angel with a soldier. The double page, single sided card measures about 5 x 4 inches. Includes a slip from the German Graves Office that he was buried in Vermandovillers, France. 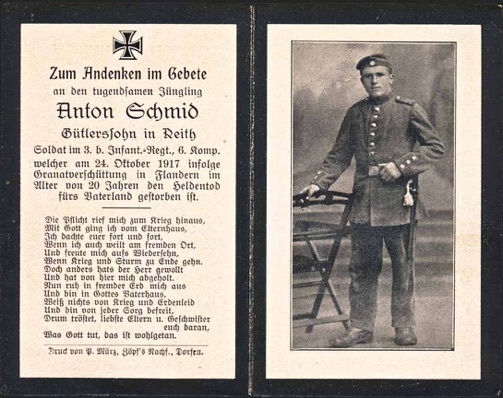 WW1 German Death Card (Sterbebild) for Army Soldat Anton Schmid, 6 Company 3 Bavarian Infantry Regiment. From Reith. Buried from the impact of a mortar in Flanders, 24 October 1917. He was 20. The back of the card has a rendering of Mary with a soldier. The double page, single sided card measures about 5.25 x 4.25 inches. 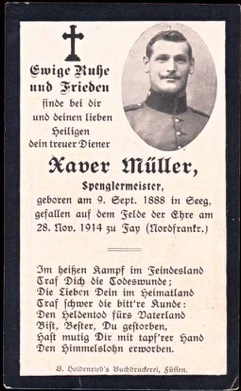 WW1 German Death Card (Sterbebild) for Army Gefreiter Xaver Müller, master plumber. Killed on the field of honor at Fay, Northern France, 28 November 1914. He was 26. The back of the card has a rendering of an angel with a soldier. The single page, single sided card measures about 2.5 x 4 inches. Includes a German Graves Office slip listing him as killed at fay and buried in a mass grave at Vermandovillers, France. 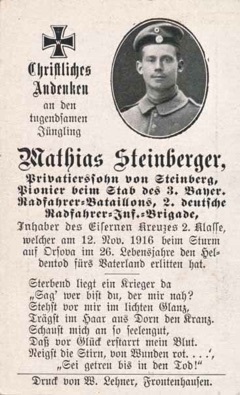 WW1 German Death Card (Sterbebild) for Army Pionier Mathias Steinberger, 3 Bavarian Bicyclist Batallion 2 deutsche Radfahrer Infantry Brigade. From Steinberg. Was awarded the Iron Cross 2nd Class. Killed during an assault on Orsova, 12 November 1916. He was 26. The back of the card has a rendering of Jesus on a battlefield. The single page, single sided card measures about 2.5 x 4 inches. 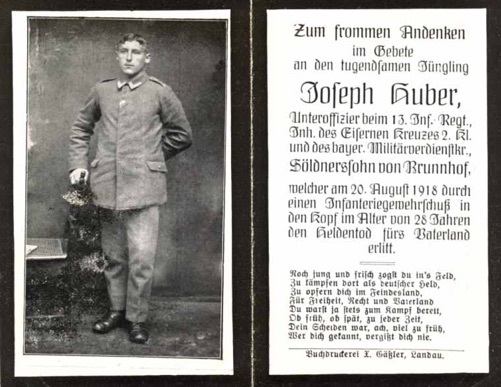 WW1 German Death Card (Sterbebild) for Army Unteroffizier Joseph Huber. Professional soldier’s son from Brunnhof. Was awarded the Iron Cross 2nd Class and the Bavarian Military Service Cross. Killed by an infantry round to the head, 20 August 1918. He was 28. The back of the card has a rendering of Jesus with a soldier. The double page, single sided card measures about 5.25 x 4 inches. Includes slip from the German Graves Office that he was killed by Crapeaumesnil and buried in Lassigny, France. 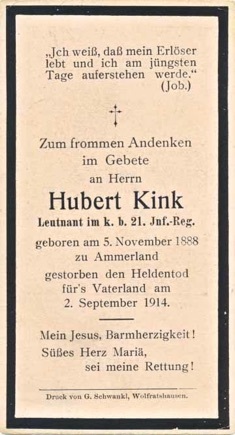 WW1 German Death Card (Sterbebild) for Army Leutnant Hubert Kink, 21 Infantry Regiment. From Ammerland. Killed 2 September 1914. He was 25. Includes slip from the German Graves Office that he was buried in Gerbeviller, France. 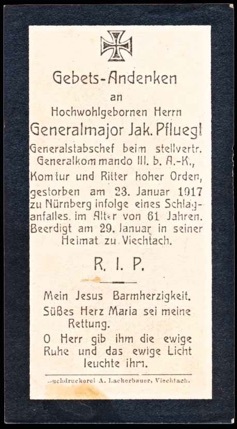 WW1 German Death Card (Sterbebild) for Army Generalmajor Jakob Pfluegl, Stellvertrater Generalkommando III Armee Korps. Komtur and Knight of high Orders. The back of the card has a rendering of an angels with a cross. The single sided card measures about 5.25 x 2.25 inches. A rust stain at the bottom.